Spill Proof – Stop pouring money on the ground. 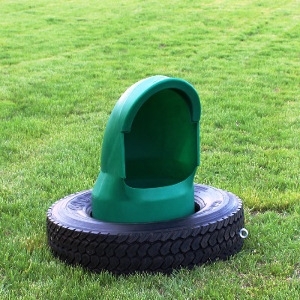 The weight and friction of the tire combined with the durability of the polyethylene feeder make it virtually impossible to be turned over by livestock. Including mature bulls. Minerals are expensive yet essential to livestock nutrition and performance. Especially if supplemented with medications and or insecticides. Don’t let mineral waste increase your cost. Portable – The AmeriAg feeder is the most portable feeder on the market. Rotational Grazing, also known as (MIG) Management Intensive Grazing, as well as Mob and Holistic Grazing require frequent movement of livestock. The feeder can be moved effortlessly with an ATV, Truck or Tractor. Simply hook a chain to the galvanized eye bolt (included) and drag the feeder from one pasture / paddock to another. Frequent feeder movement also prevents pasture damage during wet weather. The stability of tire prevents turn over when dragging. High Capacity – The AmeriAg Feeder can hold up to 250 lbs. of mineral. 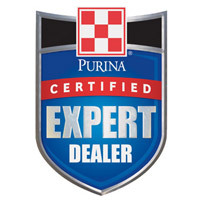 Beneficial and economical for producers with large herds as it lengthens time between refills. Color – The hunter green or black color of the feeder serves two purposes. First, built in ultra violent inhibitors prevent damage from the sun. Second, it blends in well with the surrounding landscape. Environmentally Friendly – When used in conjunction with a used 24.5" rim size tire, it prevents a tire from entering our landfills.